PG 15. Parental Guidance. Suitable only for persons of 15 years and over. Not to be supplied to any person below that age. This is an Eros Internationl brand of the Hindi DVD. Has the UPC Code 82897001298. Has EROS Seal. 174 minutes Color. Dolby Digital 2 Channel Sound. HAS ENGLISH SUBTITLES. Produced by: Ganesh Jain. Directed by: Abbas-Mustan. Music: Anu Malik. 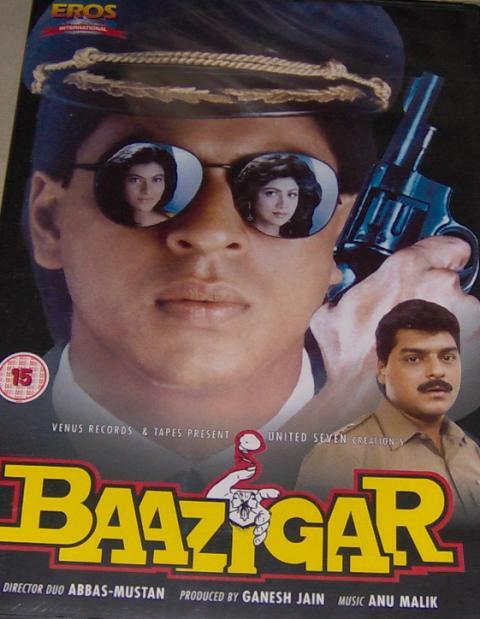 Staring: Shahrukh Khan, Kajol, Shilpa Shetty, Dilip Tahil, Siddharth & Others. Release Date: 12 Nov 1993 (India). 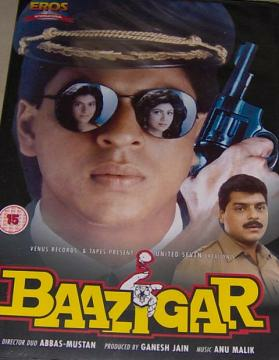 Buy Baazigar (2005, DVD), sold & shipped by Movie Time Video where you can shop online for Pooja Mandir, Bajot, Gifts, Hindi Movie DVD / CD, Music Video. This Hindi Movies collection has been tagged as Nil NEH 7.00 19.93 sam shahrukh khan kajo; shilpa shetty dalip tahil.